Visitors to Harkers Island this summer may wonder about the unusual metal structure at the entrance to the popular Core Sound Waterfowl Museum & Heritage Center. 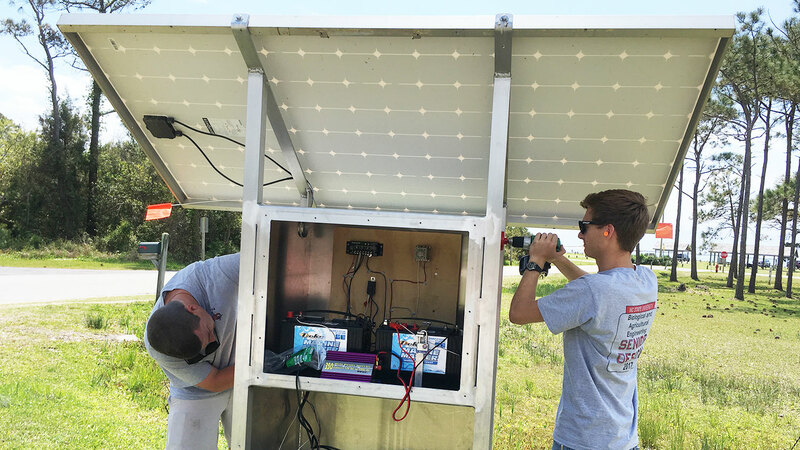 The “stormwater wetland and solar-powered pumping station” may sound like a mouthful, but it will do one very important thing: resuscitate a wetland that will have significant environmental and educational impact on the island. Built entirely by students in the Department of Biological and Agricultural Engineering (BAE), the pumping station is the product of months of hard work in the department’s senior capstone program. The student team — Mason Marriner, Alex May, Kristen Navaroli, Meghan Porter and Taylor Williams — did everything from designing the pump to wiring the control panel to cementing the structure into the ground at Harkers Island. They procured all parts and pieces for the project and burned the midnight oil at Weaver Labs on many occasions. Their massive effort won them the “Outstanding Senior Design Team” award at graduation. With a Duke Energy grant in hand, the Core Sound Waterfowl Museum approached BAE alumnus Kris Bass, who owns Kris Bass Engineering, to take on the wetland restoration project. He turned immediately to the department, believing that it would be a great fit for the senior design program. Before the museum and road existed, a natural wetland occupied much of that section of Harkers Island. It was drained years ago to make way for development. The area is going to be designed in a way that also encourages runoff from surrounding parking lots and roads to enter the wetland, which will filter pollutants from the water before it reaches the sound. Another key benefit of the project? Educational services. The pumping station is in place now, and construction of the wetland will take place this summer. The student team created a maintenance log that the museum will use to keep the wetland healthy and thriving for years to come. Interested in creating opportunities for future BAE Senior Design Students?